I’ve never tried Caviar before but when an advert came through the door a few months back stating that our local Aldi would be selling some type of Beluga caviar I added a reminder to my calendar. 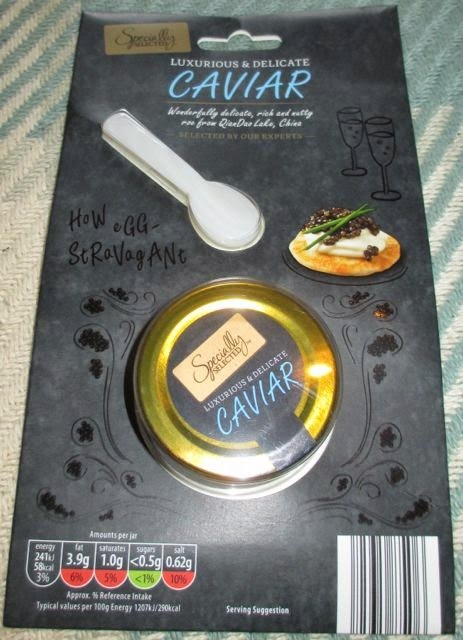 Now there has been a lot of controversy since then about this Caviar on the internet, including the labelling of the type and the cut down price. I’m not knowledgable enough in the intricacies of Caviar to comment, but I knew it was something I still fancied trying so picked up a small jar for just £9.99. The pack states that this roe originates from QianDao Lake, China and is from a cross bread of Sturgeon. 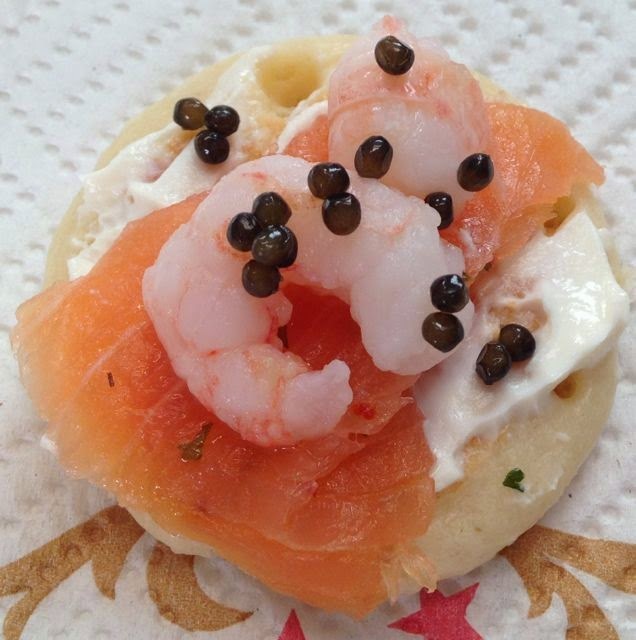 I knew this Specially Selected Caviar need a special occasion and what better than the big day served with blinis, cream cheese, smoked salmon and prawns. The packaging is eggstremely well put together, all neatly packed with a posh card outer case, with a little Caviar spoon to help serves it. I wasn’t sure what to expect when I opened up the jar, and have to admit I was expecting something more liquid, but the roe are quite dry and easily spooned out. I tried three little eggs on their own and was impressed by their flavour. They weren’t too strong, and had a good fishy flavour, and a hint of saltiness. Texture wise they were fairly firm, but burst nicely delivering the taste. Sprinkled on our blini concoction they looked fab, and made them look super posh. I liked the hint roe taste mixed with the salmon, it enhanced the flavour and the appearance. I don’t eat blinis and salmon that often, but if I’m after something a bit special this is something I’d buy again as a luxurious treat to top it.